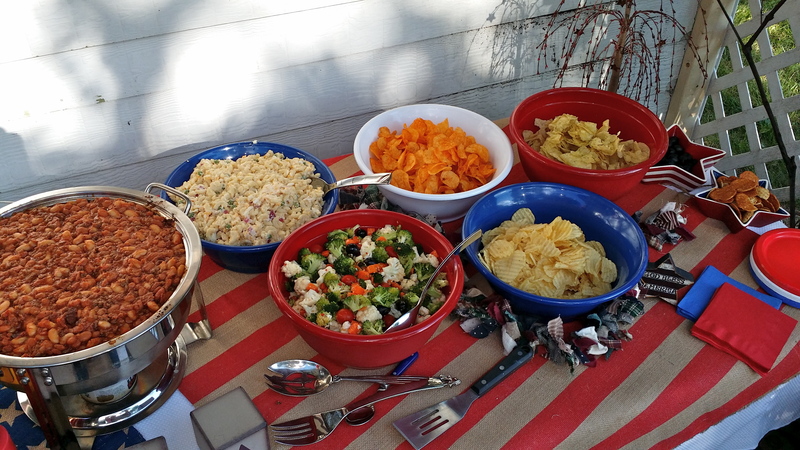 This barbecue was fantastic – so tender and flavorful. The recipe is from Dawn’s good friend, Greg Thornton, from Cincinnati, Ohio. He generously agreed to share his famous recipe with us! These baked beans are a family favorite. 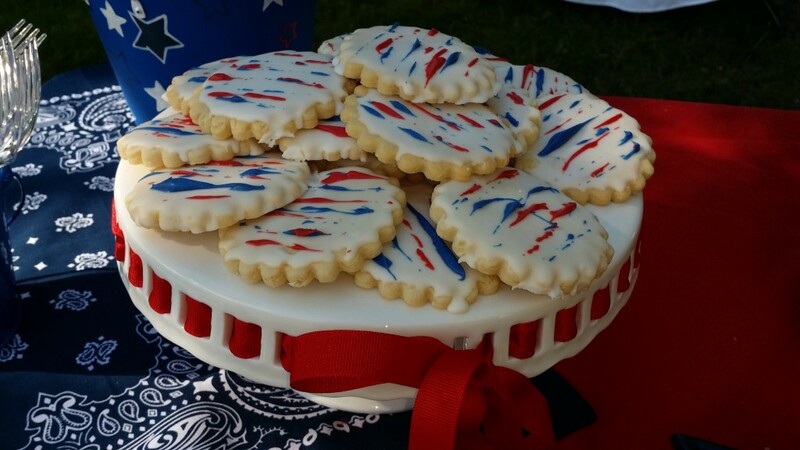 The recipe originated with our mother-in-law, Cheryl Badger and was always requested by her kids and grandkids. 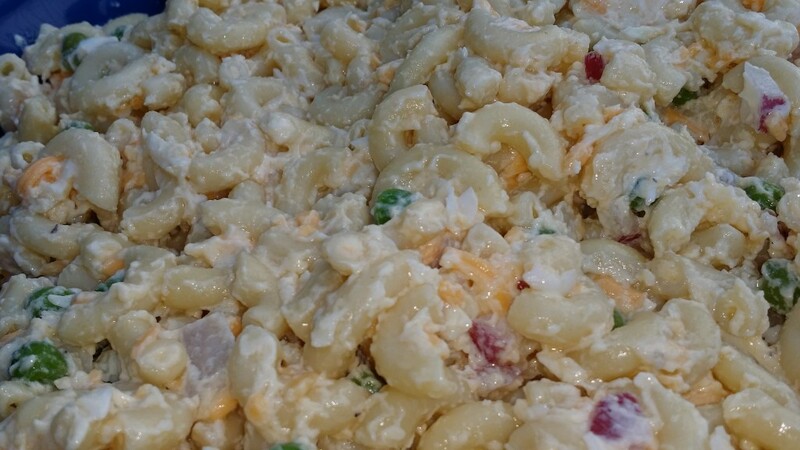 Another family favorite, I make this macaroni salad anytime we’ll be grilling or doing summer entertaining. We love it! This dish makes a great complement to any summertime meal. It is super easy and yet delicious. 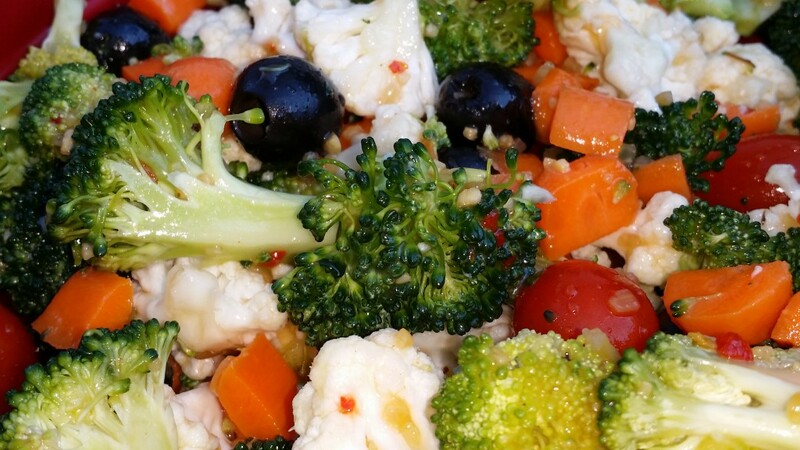 The longer the salad sits in the refrigerator, the more flavorful it becomes as the veggies soak up that Italian Salad Dressing! I usually make it the night before I’ll be serving it. I always say our favorite part of the meal is dessert. Fourth of July was no exception. 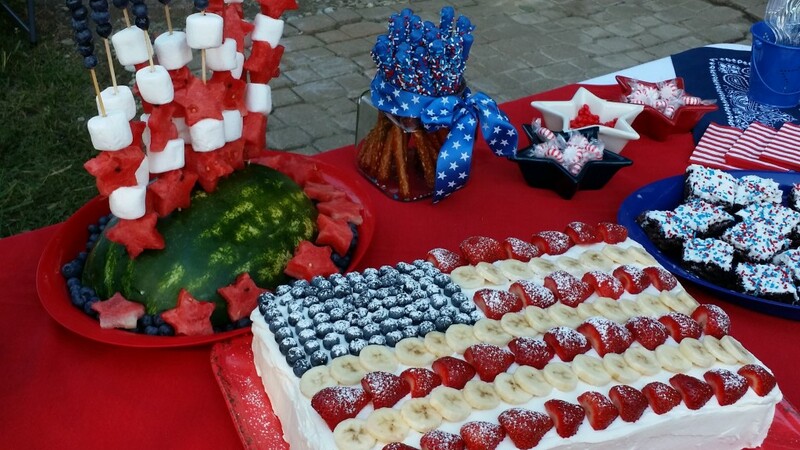 Several desserts were basic – brownies, made from a box, with white frosting and red, white and blue sprinkles; chocolate covered pretzels, fruit skewers (made in the shape of a flag) and assorted candies. But there are three special desserts we encourage you to try. This cake not only tasted delicious but looked gorgeous. Good friend, Kathy Stump, brought the cake to our celebration and graciously shared her recipe! Slice 24 well shaped strawberries in half lengthwise. 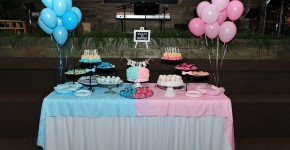 Set aside for top of cake. Coarsely chop the remaining strawberries about 1 cup or so. Set aside. Spoon almost 3 cups of whipped cream in another bowl, fold in chopped strawberries. Set creams aside. Place one cooled cake layer on a large serving board, tuck strips of waxed paper under the sides of the cake to keep the serving board clean. Spread the whipped cream over the top and sides of cake. Remove the waxed paper strips. In the upper left corner of the cake, mark a 6 1/2 by 5 inch rectangle with the tip of a knife. 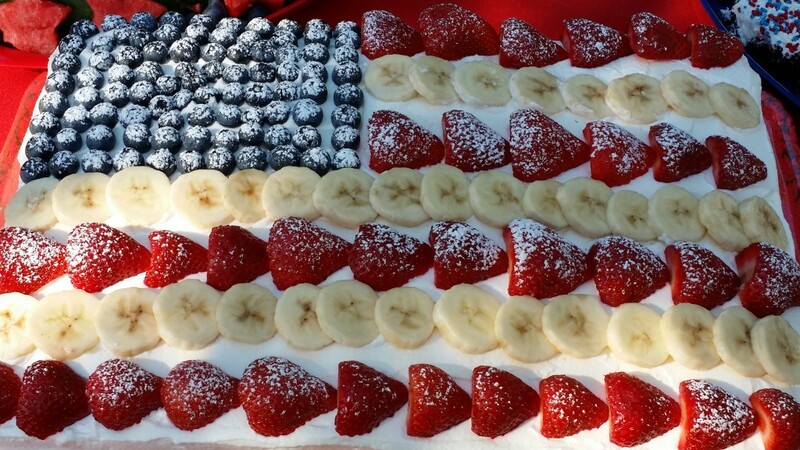 Place the blueberries in even rows in the rectangle to form the stars of the flag. To form the stripes, alternate strawberry halves (cut side down) with banana slices, beginning with the strawberries. Overlap fruit in each row. 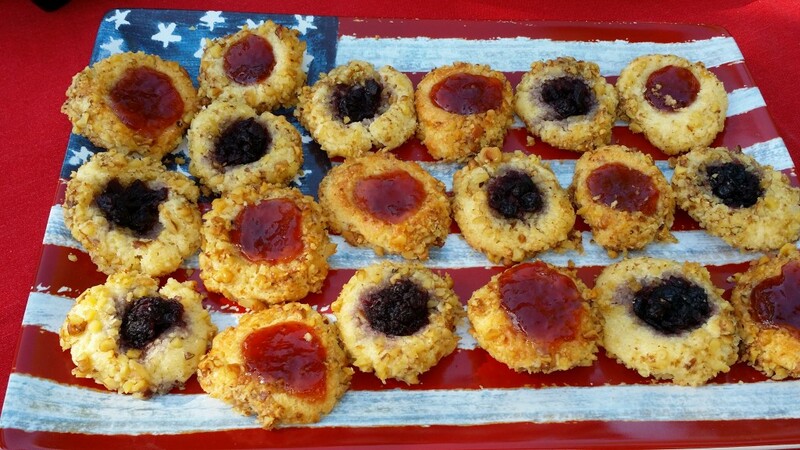 People usually think of thumbprint cookies for Christmas, but we thought they could be fun for his holiday as well. Simply use blueberry jam for the blue and strawberry or raspberry jam for the red. It works!